UNE Health is fortunate to offer students clinical placements in a variety of different roles within the following sectors. Clinical Placement is an exciting experience for students to demonstrate their academic practice in the training environment and increase student awareness and understanding of specified areas of practice. 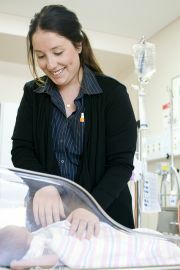 Clinical Placements predominantly occur within NSW, generally within the following NSW Ministry of Health Local Health Districts: Central Coast; Far West; Hunter New England; Illawarra Shoalhaven; Mid North Coast; Northern NSW; Nepean Blue Mountains, Murrumbidgee South Eastern Sydney; Sydney Children’s Hospital Network, and Western NSW. International placements are offered in conjunction with unit HSNS263 and HSNS364. Currently, opportunities exist for placements in Thailand, The Philippines, and Samoa, with possible opportunities being developed in Nepal shortly. The Australian Government partly funds the placements through a New Colombo Plan Grant, and any additional expenses could be supported with student loans. In each trip, there are places for 16 students who will be supervised by two academic staff from the SOH.